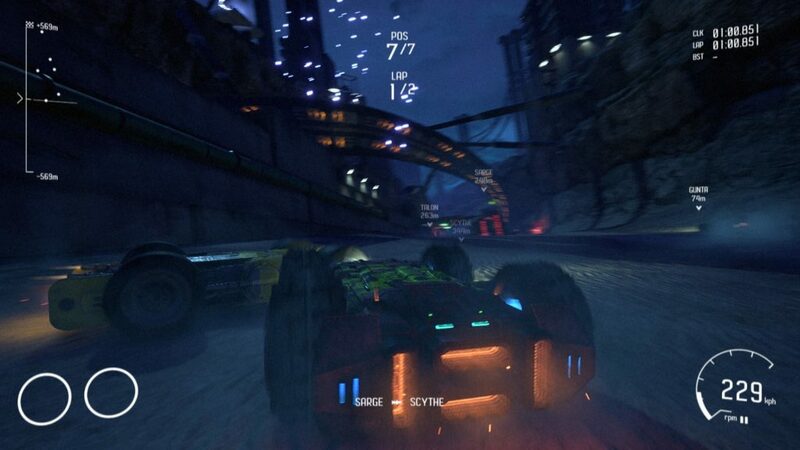 GRIP, spiritual successor to Rollcage and future racing game about cars that work equally well (or poorly) both ways up, remains a game where when it goes well, it goes very well, and when it goes poorly, you say rude words and hit the “RESTART” button. It also remains a game where the line between the two can be quite thin. As thin as a single ramp, or some inconsiderate driver you’ve just shot with a gatling deciding to get in your way after several high caliber reminders not to. Pictured: Poor combat-racer etiquette, as demonstrated by a robot. You’d think they’d learn after the fifth missile for getting ahead of me in a row. But such is life in the world of GRIP. C’est la guerre, as they say. Does that, necessarily, make it bad? Well, no. It’s aiming for barely controlled chaos, and it gets barely controlled chaos. It’s also one of the first future racers where I felt obligated to use the brakes. And, to its credit, it does mention the difficulty of the tracks, and it’s not joking when it says “Hard.” To take one example, the aptly named Acrophobia (A mountain track set above some deadly drops) finishes with perhaps the nastiest brake trick I’ve seen, a leap from one track to another vertically opposite, then… Ah, then, if you don’t immediately slow down, you’ll careen off the side of a 90 degree hard turn, rather than quickly braking (or at least, taking your finger off accelerate) dropping from the second track, slowed down, but able to take that sharply angled corner. That one caught me out more times than I care to count. I can’t deny, however, that it looks *awesome* when you pull it off. 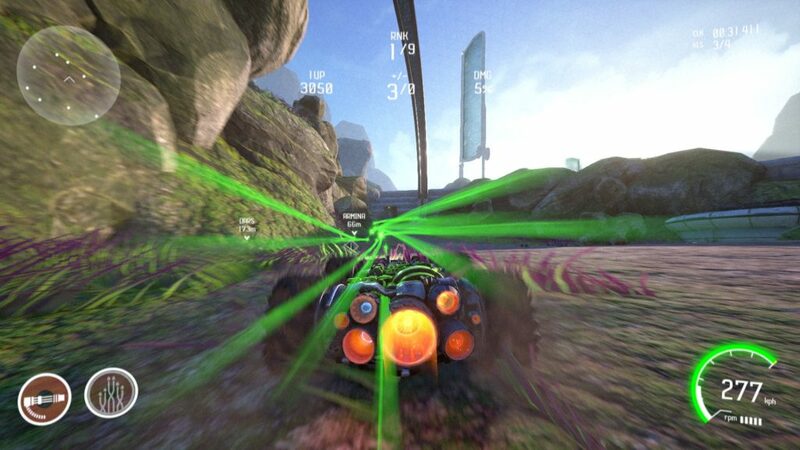 On the plus side, beyond the track design, and the usual Future Racer tricks (Such as only hitting the accelerator on “GO!” to get a boost-start… Itself mainly useful if you don’t have a conga line of racers in front to ruin said boost), difficulty can be set in a moderately granular fashion. Don’t like blowing up mid-race? GRIP feels you, and lets you turn that option off. Want packs to be more cohesive, and to never feel truly safe in a race? Rubber-banding can be turned on and off. Don’t like Blue Shells (the Hunter missile)? You can turn that off in pickups. Well, in single player and online, anyway. In Campaign, the rules are mostly set. The Hydra Missile. Poor lock-on range, situational… Still like it because it’s a swarm missile. Overall, GRIP is something I personally enjoy, while acknowledging it’s a bit of a mixed bag. The menu accessibility varies, the track signposting is iffy, the tracks can get hard pretty quick. 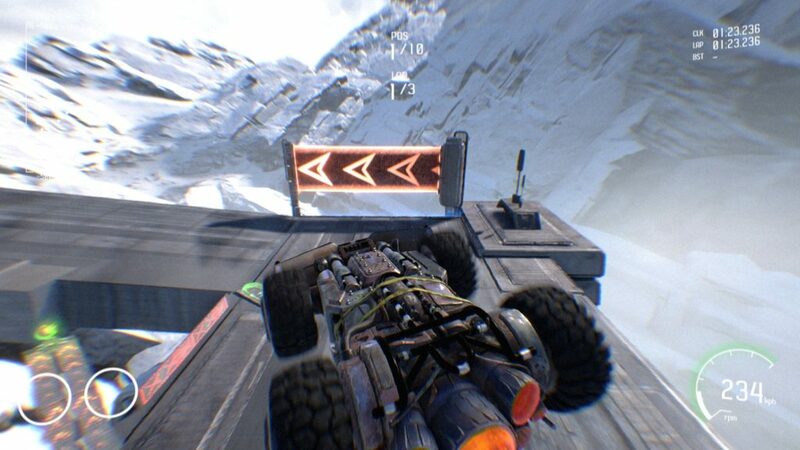 But the powerups are pretty balanced, the granular difficulty is a good choice, the music and visuals overall are pretty, and the feeling of big, chunky jet-propelled cars careening around their chosen track or arena is pretty good, right up until it suddenly feels a bit frustrating. Probably not best for first time future racers, but at least alright overall. 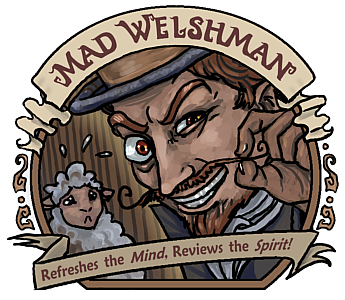 The Mad Welshman will always, when customisation options are available, go for the most garish car imaginable. It’s basically like using missiles, but for the eyes.